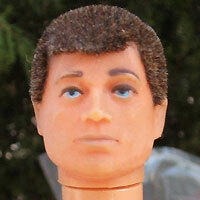 1970 saw a major change in the four year old Action man figure. A 'flocking' process that reproduced the effect of a crew-cut hairstyle was perfected and the blond and black flock-haired Action Man was introduced. This hair is highly resilient to wear and it is not difficult to find good examples. Helmets now didn't rattle or slip down when he drove one of an increasing number of new vehicles produced over this period. GI Joe was to copy this lead and gained his new look shortly after. The head was remodelled and was pliable with enhanced scar and convincing-looking skin, but the body remained essentially unchanged and in 1973 improved figures with 'gripping hands' were launched to heighten the figure's realism and play factor. These early stage gripping hands are hard to find in good condition as chemically they break down, darken and ultimately can fall apart. 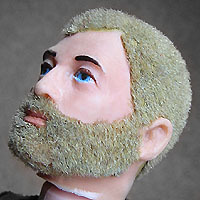 Bearded heads were introduced soon after in 1971 and a long-sideburned footballer head was also manufactured in small numbers.